The 3-foot-long logs resting against the wall near my front door are not for firewood; they’re for eating. Not the logs themselves, of course, but what’s growing inside of them. As I write and as you read, thread-like fungal mycelia are spreading within, digesting wood and growing bigger and stronger. Sometime next fall, delicious shiitake mushrooms should start popping out of the bark. Any old rotting log will not produce delicious, or even edible, mushrooms. A couple of weeks ago, I inoculated these logs with spawn of selected strains of shiitake mushrooms. The spawn originally came from www.fieldforest.net, via my friend Bill Munzer, who had some spawn left over from a shiitake growing workshop he recently held. The spawn arrives as inoculated plugs which get hammered into holes drilled into the logs. A coating of wax seals in moisture. The logs would, in fact, make excellent firewood. Bill uses oak but I only had access to Norway maple, an invasive tree that anyway is better dead than alive. The oaks should pump out mushrooms for a longer period of time, as long as 5 years, but first mushrooms might show up sooner on the maple. Not much fungal growth occurs during cold weather. On the theory that more growth sooner leads to mushrooms sooner, I’m keeping one of my logs in my cool, damp basement. An occasional dowsing with water will make sure the log stays plump with moisture. Come spring, Bill will be hosting another shiitake growing workshop and I’m going to inoculate a few more logs. I’ll report back on the progress of production from outdoor, fall inoculated logs vs. outdoor, spring inoculated logs vs. basement, fall inoculated logs. Most important is my remembering not to accidentally saw up the logs near my front door for firewood. Those 3-foot-long logs by the door are now nearly buried in snow, as is the rest of the garden. This recent snow has brought my outdoor salad pickings to a screeching halt. Not that the endive, lettuce, radicchio, radishes, parsley, and arugula protected beneath tunnels of clear plastic are necessarily dead. It’s just that I can’t get to them. The snow became heavy and later turned to a freezing mist that effectively sealed the edges of the plastic tunnels right to the ground. 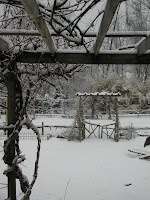 The weight of snow has bowed down the plastic along the rows between the metal wire supports, making it look like the garden is being colonized by giant, white caterpillars. It’s probably nice and cozy in those tunnels, though, and I am confident that everything is fresh and ready for picking despite December 13th’s morning reading of 7 degrees Fahrenheit. As soon as the snow thaws and some of it begins to melt away, I’ll peek beneath the plastic and, if everything inside is cozy, as expected, pull away more snow to make the salad pickings more accessible before truly bone-chilling weather establishes itself for the season. After writing the above, I became more curious about what was happening beneath the plastic so I bundled up and went outside for a look. After breaking chunks off large chunks of snow and tossing them elsewhere in the garden, I finally was able to peel up the plastic and assess the situation. And since it was nearing supper time, I thought I’d see what kind of salad I could harvest for dinner rather than just taking a peek. Frisée endive was, as expected, turning a bit mushy. Note to myself: Don’t grow Frisée again; it doesn’t stand up well to cold and it’s hard to find dirt and slugs among the frizzy leaves. Escarole (Broad Leaved Batavian endive), on the other hand, looked a little weather-beaten but otherwise fine. The only lettuce still out in the garden is New Red, which stood as proud and as fresh as it would have any day in spring or early fall. Arugula likewise seemed not to acknowledge that temperatures had been and were quite cold. The salad, supplemented by celery from the greenhouse and whisper thin slices cut from turnips in cold storage in my mud-room, was freshly delicious. Late news flash: The thermometer on morning of December 18th reads 3 degrees! Outdoor salad pickings? Hmmmm. Perhaps no more. Orchids are one group of plants I’ve regularly sidestepped. It seemed to me that if you grew orchids, you became crazed over orchids, to the exclusion of other plants. You then fill your home with as many of the over 20,000 species as you can cram onto your windowsills. I feared being led down that path. My sidestepping took a turn into orchid-land 20 years ago when a local orchid enthusiast gave me a plant of Odontoglossum pulchellum, which I today learned has also been called lily-of-the-valley orchid. But more importantly today, the plant is in bloom. Blossoms from this plant are no rare occurrence; it’s bloomed every year for about the past 15 years. Usually, though, blossoms wait until February to unfold. Odontoglossum pulchellum doesn’t sport knock-your-socks-off, traffic-stopping blossoms; instead, they have a soft, suble beauty. 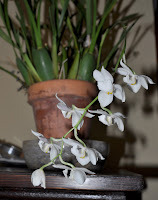 Right now, delicate, arching flower stems rise up from clusters of torpedo-shaped, green pseudobulbs perched up out of the “soil.” Eight to 10 dainty, waxy, white blossoms line up along each flowering stem and a sweet fragrance, more like paper whites than lily-of-the-valley to me, that transports me to spring. I get all this for very little effort and without becoming orchid-crazy. For years, I didn’t know the name of my plants so couldn’t even look up how to grow them. Rather than pot them up in any special orchid soil, I merely mix an equal volume of wood chips from my outdoor pile into my regular, homemade potting soil, along with a bit of soybean meal for extra nitrogen. I keep the plants in a sunny window in winter and sometimes move them outdoors in summer, dividing and repotting the pseudobulbs to make new plants. For this bit of effort, I get fragrant, white blossoms every winter, and they last for at least a month. Odontoglossum pulchellum is easy to multiply yet I’ve happily managed to restrain myself to keeping only 3 or 4 plants after I’ve divided and repotted them each spring. Growing good celery demands a gardener’s greatest skill, and this year, in the greenhouse, I have the finest celery I’ve ever tasted or grown. The stalks are large, thick, juicy, even a little sweet. Unfortunately, I’m not sure I can take credit for this horticultural achievement. Every summer I sow celery seed to transplant into my minimally heated greenhouse to provide stalks for salads and soups throughout winter. I do take credit for selecting a good variety: Ventura, available from Fedco Seeds and Johnny’s Selected Seeds. I also take credit for providing good soil conditions; each year I slather an inch or so of ripe compost on all the beds in the greenhouse. And I’ll take credit for providing timely watering, with drip irrigation until a couple of weeks ago and by hand through winter. Ventura is an open-pollinated, rather than a hybrid, variety, which means that I can save my own seed for replanting each year. Beginning a few years ago, I’d allow one or two of the greenhouse Ventura plants that began to form flower umbels to do their thing and make seed, which they did prodigiously. I’d collect seed for planting the following season’s outdoor and indoor celery. Some of those seeds would drop to the ground and germinate, and they sometimes grew into seedlings as good or better than the plants I would later transplant into the greenhouse. Especially this year. While my transplants are still growing to harvestable size, these “volunteers” are already ripe and juicy. And especially ripe and juicy this year. Why? I don’t know. I like to think I had a hand in all this. Nothing like a little snowfall to clean everything up in the garden. December 5th was the date of the first snow, and the white blanket covered the pile of crocosmia leaves lying on the ground and waiting to he carted over to the compost bin, some weeds that sprouted in the mulched area beneath the dwarf apples, some of the smaller plants I haven’t yet cleared from vegetable beds, and numerous other messy distractions. The whole view was knit together in the sea of whiteness. Alas, now, three days later, the snow is already dissolving away. I’ll get to those jobs soon – unless another snow falls first. Late news flash: December 9th, another snowfall, more landscape-worthy than the first. Time for the next step in hunkering down for winter – not by caulking around windows, not by propping snow shovels next to the front door, not by waxing up the skiis. What winter will need is flowers. Or, at least, I need flowers to make winter more pleasant. Poinsettias and jasmines are the flowers du jour. Not that either is blooming yet. As I said, it’s time for the “next step” in preparing for winter. Both these plants would naturally bloom sometime in spring but I need them blooming in the depths of winter. I began planning for both plants’ winter bloom back in September’s balmy days. Not much was required. All the plants needed were nights of uninterrupted darkness and cool temperatures. And, for the jasmine, also being kept on the verge of thirst. With more than enough neglect behind them, these plants should be ready to bloom. 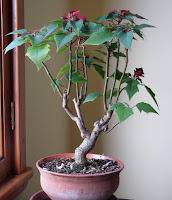 The poinsettia came up from the cool basement window where it resided since October, and the jasmine came in from the cool greenhouse, where it resided since early November. Both plants are now sitting in warm rooms basking in the sun of south-facing windows, and will hopefully blossom within a few weeks. I could have – should have – brought the plants to those warm, sunny windows a few weeks ago. Then, they might have been in bloom for the holidays. November sped by too quickly. Winter preparations are also going on outdoors. I’m winterizing – not my car, but my trees. First comes a 2 to 3 inch layer of wood chips beneath the plants. Rather than the conventional, tight landscape ring around the base of the tree, which does little more than keep mowers at bay, my young trees get mulched out at least as far as the spread of their branches. Older trees’ roots fend for themselves in mowed ground without mulch. Next comes protection from rodents. Mice revel in that soft layer of mulch around trees so I keep it back a few inches from trunks. Then, mice may have lodging but at least no ready food. 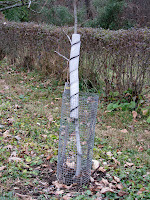 To further keep them and rabbits at bay, each young tree gets a 2-foot tall cylinder of quarter- or half-inch mesh hardware cloth at its base. The hardware cloth cylinder is thoroughly effective until a foot or two of snow accumulates, at which time the rabbits perch on top of the snow and casually munch on small trunks and branches. To thwart such bad behavior (from my perspective), above the cylinders I swaddle trunks and main branches with plastic spirals (sold for protecting trunks). And then there’s winter cold. Actually, cold and warmth, which together is what drive trees crazy. Imagine a bright, cold, winter day: The sun shines on dark tree bark, warms it, then, abandoning the tree, drops below the horizon. Temperature of that warmed bark immediately plummets, to the tree’s dismay. To prevent see-sawing temperatures, I either paint trunks white with latex paint diluted half with water, or wrap trunks with white Dewitt Tee-Wrap, which also protects trunks from borers. Back indoors, one plant that won’t be brightening winter with its blossoms will be my gardenia. The foliage has collapsed, dried and shriveled. Yellowing of a few leaves a few weeks ago made me suspect that the plant was hungry for some nitrogen. Perhaps a more acidic soil was needed, or iron. Not. Not. Not. I finally gave up the ghost on the plant, tipped it out of its pot, and performed an autopsy. The roots looked surprisingly healthy. Not so, the stems. Slices into it at various points revealed grayish brown flesh indicating the plant was thoroughly dead at least down to its roots. Despite the healthy appearance of the roots, I suspect that the problem was too much water. (Or too much fertilizer?) Especially in cool weather, gardenias get sick and often die from excessive water. Gardenias are amongst the most challenging of houseplants to grow. Yet I remember a beautiful, large gardenia plant basking in a sunny window in the house of my friend Mike’s mother, who otherwise had no particular interest or skill with plants. I’m not giving up. I’m getting a new plant. Plants grow and multiply, which sometimes causes trouble. Such trouble was highlighted this week with my digging crocosmia bulbs. Backpedaling perhaps 10 years, we find me ordering crocosmia bulbs from a mail-order catalog. 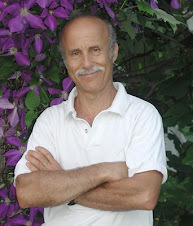 I’d seen the plants blooming in a friend’s garden in New Jersey and marveled at the graceful flower stems that arched up and out from clumps of sword-shaped leaves. Lined up near the ends of each flower stalk were pairs of tubular, hot scarlet blossoms. Crocosmia isn’t supposed to be cold-hardy outdoors where winter temperatures drop below minus 20 degrees F., so the first couple of autumns, as instructed, I dug up the bulbs for winter storage. Each spring following, the plants would get off to a slow start, finally blooming late in the season or not at all. In disappointment or laziness, I stopped digging the bulbs up each fall. I was surprised to see them appear in spring anyway. Not only did they appear in spring; they had some real oomph, growing almost as luxuriantly as the ones in my friend’s garden. To make matters better, they started blooming earlier, in July, and in great profusion, and they have done so reliably year after year with no help at all from me. The crocosmias also multiplied, and they did so with such enthusiasm that there became just too many of them at the original location. So I started digging. And I uncovered bulb after bulb after bulb, ready to bloom and multiply next year. Now I have to decide what to do with all those bulbs. Plant them? Give them away? Compost them? I would have never thought I could have had too many crocosmias. Does anybody still dig up their gladiolas each fall? I don’t, but to no avail. Left outside, they still survive every winter. Yuk. I don’t like gladiolas. Perhaps it’s because they are the most popular flower for funerals. 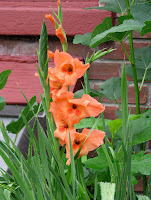 At any rate, I did, for some reason, plant some glads over 20 years go, glads whose beautiful salmon, pink color, I subsequently felt, was wasted on glad flowers. The nice color couldn’t outweigh the funereal associations, so after a couple of years of digging them up for storage each fall, I decided to sacrifice them to winter cold. Hah! Doing nothing at all has, unfortunately, worked fine for me. At least the gladiolas haven’t multiplied as fast as the crocosmias. 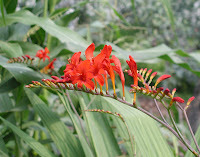 The whole concept of winter hardiness for a plant only whose roots (or corms, in the case of crocosmia and gladiola) need to survive winter is hazy. After all, three feet down in the soil almost everywhere, temperatures hover around 50 degrees Fahrenheit. Nonetheless, the ground that the crocosmias and glads call home is well-insulated from winter cold. Warmer winters for the past few years have, no doubt, also helped these “nonhardy” bulbs survive outdoors, especially the less cold-hardy crocosmia. My blueberries make me happy, so I make them happy. (They made me happy this year to the tune of 150 quarts of berries, half of which are in the freezer.) I don’t know how much work bearing all those berries was for them, but I have begun my annual fall ritual of lugging cartload upon cartload of wood chips over to the berry patch to spread beneath the whole 25 foot square planted area. I don’t begin this ritual spreading until the blueberries’ leaves drop. Then, old leaves and dried up, old fruits are on the ground and get buried beneath the mulch, preventing any disease spores lurking in these fallen leaves or fruits from lofting back up into the plants next spring. Rainy, overcast summers or hot, dry summers or any weather in between – my bushes have never had any disease problems. I did do two things before spreading that mulch. First, I spread some nitrogen fertilizer: my universal pabulum, soybean meal, at the rate of 2 pounds per hundred square feet. And second, I spread some sulfur, at about the same rate, to keep the soil acidic. The mulch, a couple of inches depth, went on top of the soybean meal and sulfur. In past years, I’ve mulched with leaves or with wood shavings. Pine needles would also be fine, as would any other weed-free, organic material. 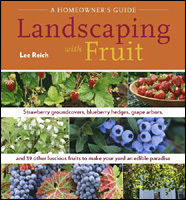 Besides suppressing potential diseases, that mulch decomposes to create a soft root run that retains moisture, just what blueberries’ fine really like. 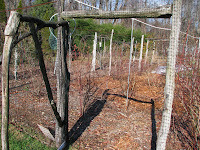 Mulch and good nutrition coax my bushes to make a couple of feet or more of new growth each year. Fruit is borne on shoots that grew the previous season, so all that new growth translates into a good crop in the offing for next year. 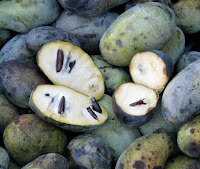 This year also brought in a bumper crop of pawpaws, another learning year for growing this uncommon fruit. Pawpaws are the northernmost member of the tropical custard apple family, and the fruit does indeed taste very tropical –a flavor mix of banana, mango, avocado, and vanilla custard – even though it’s easy to grow and native throughout much of the Northeast. Two trees would be adequate for most households; I have about 20, just so I can learn more about them and their individual differences. That makes for a lot of pawpaws! Right after bloom, I started thinning the small fruits. Pawpaw has a multiple ovary so each blossom can give rise to as many as 9 flowers. Some research indicates that reducing the fruit numbers would yield bigger fruits, which we humans like, especially when the fruits have large seeds, as do pawpaws. The small fruits are hard to see because they match so closely the green color of the leaves, so I didn’t thin as many as I had hoped. That said, at season’s end, fruits on thinned clusters seemed no larger than fruits on unthinned clusters. That said, the trees did bear a lot of large fruits. Beginning around the middle of September, I began harvesting the first fruits. I picked some up from the ground and picked some soft and some firm from the trees, all of which continued up until early November. I was curious how well the fruits would keep in cold storage. They kept better than expected; ones that I picked back on September 29th and October 17th are still flavorful. I also wanted to see which varieties (grafted, named clones) or seedlings (unnamed plants grown from seed) tasted or stored best. Nothing consistent bubbled to the surface in this regard. Expanding the palate, I also offered a lot of tastes locally and beyond. The only thing consistent was the “Wow” that followed those tastings. Almost everyone loves the taste of pawpaws. 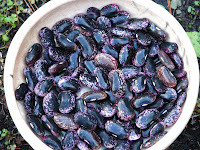 Scarlet runner beans were not a bumper crop this year, but only because I didn’t plant many. I grow this vining bean, as do most people, primarily as an ornamental, for its scarlet blossoms. I occasionally eat the fat, hairy, yet delectable green beans. Every year I collect some of the matured black and pale purple, calico seeds for replanting the following year. This year, I decided to cook up some of these seeds and taste them. Scarlet runner bean seeds are quite tasty (and, I learned prior to eating, nonpoisonous). So I collected all the mature seeds still hanging on the dead vines. Next year my yard will be aflame in scarlet flowers and, because the plant is pest-free – even to Mexican bean beetles -- I expect to reap a bumper crop of beans.